Taking pictures from a train usuallay did not work for me in the past. 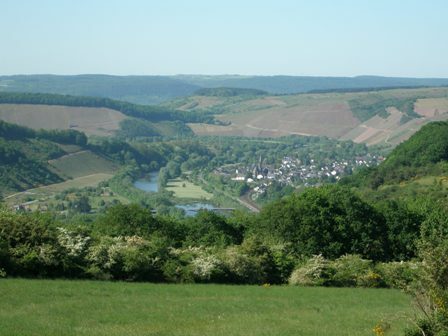 However, the other day when I visited the Mosel river and my home town Trier, I tried it again with my new digital camera. The outcome is not too bad, I think. 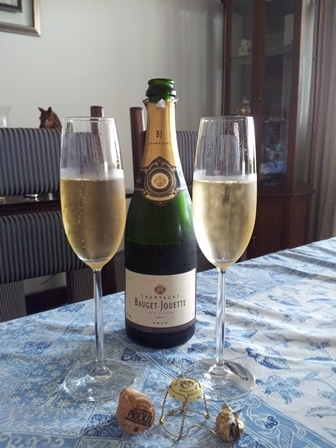 And this is why I want to share it with you here on my blog. Unfortunately, I did not catch famous terroir, single vineyard locations and/or famous wine villages and towns, just some no-name impressions. 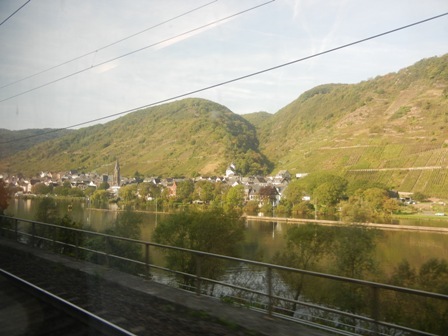 In any case, this is maybe the best view one can get of the Mosel: exploring the region on a train. 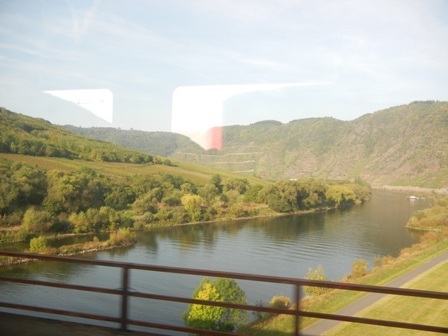 I suggest to any tourist and casual visitor to this part of Germany to take the train from Koblenz to Trier and enjoy from the regional express train the sometimes spectacular views of the Mosel valley and its vineyards. 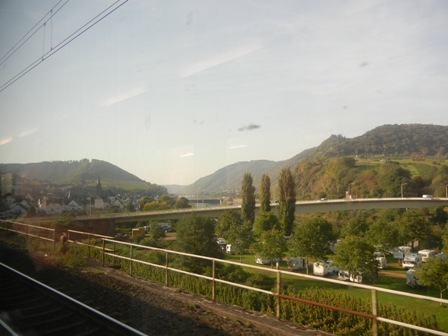 The river bed, train tracks, and a country raod, all three have to find a space in the narrow Mosel river valley. 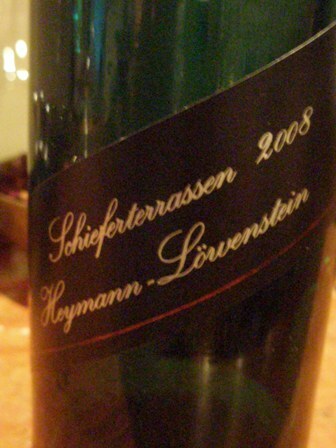 That the vineyards are located on the steep slopes is not an accident. This is where the slate underground reflects the sunlight and keeps the vines warm for the optimal ripening of mainly Riesling grapes. The steep slopes are hard work for the vintners. 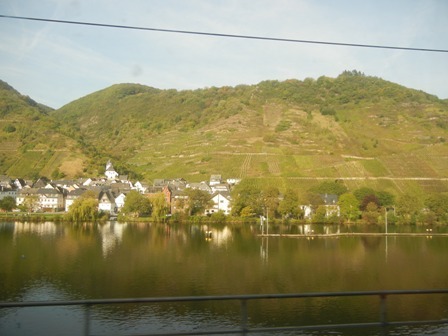 I love the Mosel. 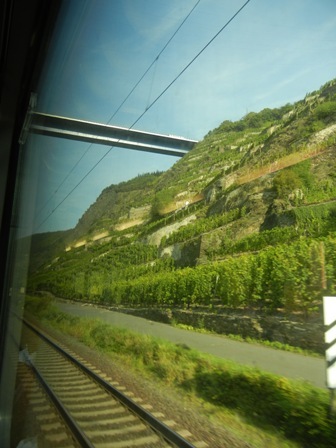 I find it extremely relaxing to sit on the train and watch the landscape along the winding valley. 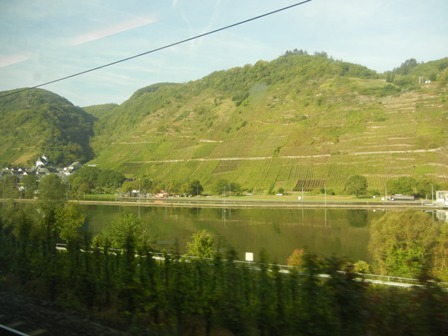 Alternatively one can also visit the Mosel by pushbike or car. Every way of transport, every way of movement will bring new insights and offer other aspects of this magificent river landscape.